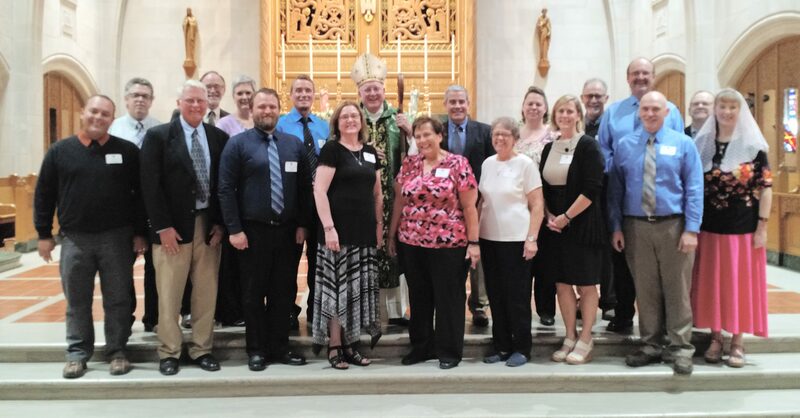 On Aug 26,2017, Bishop William Patrick Callahan commissioned 21 new leaders of prayer for the Diocese of La Crosse. This is a three-part course of study by which lay persons are prepared and commissioned to serve their parishes by bringing Holy Communion to the sick; conducting a Liturgy of the Word, possibly with distribution of Communion, on weekdays when a priest is unavailable (or on Sunday in an emergency); and by leading parishioners in prayer at times of illness or death. In nursing homes or healthcare facilities, when no priest is available, they may also conduct a Sunday Celebration in the Absence of a Priest. The newly commissioned leaders of prayer are: Jonathan Anderson, Timothy Betker, Virginia Dushek, Patrick Gierl, Thomas Hynes, Michael Kamrowski, Robin Major, John McDonnell, Timothy Mika, Debbie Riske, Donna Rule, Gordon Ruplinger, Shelly Schultz, Anthony Shay, Ann Walgenbach, Steven Welter, John Woehrle, Rosemary Wolf, Kurt Zakrzewski, David Zebro, and Lora Zebro. If you are interested in applying to become a Leader of Prayer, contact Chris Ruff, Director of the Office of Ministries and Social Concerns to learn more.